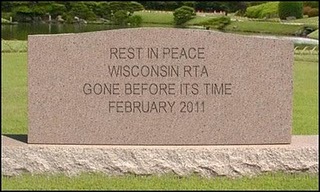 LiberTEA Racine: RTA Rest in peace. Good bye RTA. You wasted your life and those of us who never voted you in to existence, but we found a way to vote you out. Kudo's to Vos and WanGaard, the tens of millions dollars we will save because of just this one death. Great No RTA and No KRM Boo Hoo....Let's talk about real solutions for the prosperity of Racine. Easy access to the Freeway. If there were a fast way from getting from the Lake Front to I-94, it would make convenient, attractive place for people to live and commute. Yes people drive their cars to work. Boo Hoo I can't take a train to drop me in downtown Milwaukee. 531-There is an old railroad spur that goes from I-94 near Hwy 11 all the way east to Racine Street. It could serve as a downtown spur much like the Mitchell Airport Spur. It would benefit Modine, SC Johnson, the empty Southside Industrial Park and of course downtown. The idea was mentioned a month ago before the Racine Common Council. Call your alderman or speak before the council and tell them you like the idea. Na na na na, na na na na, hey hey hey, Good-Bye!